From the one of the top gastronomic centers in all of South America! In recent decades, Peru has emerged as one of, if not the top gastronomic centers in all of South America. Blessed with a rich variety of ingredients that come from its diverse climates-including oceanic coast, deserts, tropical Amazon Rainforest, and high Sierra Andean highlands-it is no wonder the medium-sized country has capitalized on its resources. Some dishes have even entered the global scene, such as ceviche, the national dish of fresh raw fish “cooked” in a marinade of lime juice and topped with red onions, choclo corn kernels, and smooth slices of red potato. As for drinks, the ubiquitous pisco sour made of strong grape brandy, lime juice, egg whites, and optional bitters is the cocktail any Peruvian would be proud to call his own. However, for all the scrumptious seafood cuisines and fresh juice and pisco drinks that Peruvians enjoy on a daily basis, they also relish some truly unique items. So if you are a food enthusiast who is willing to try anything, give these items a go the next time you’re on a Peru vacation. Anticuchos - If there’s one thing that Peruvians like to eat, it’s grilled and barbeque meats. Nothing brings new friends closer together than a parillada (barbque party). At some point, it is almost guaranteed that someone will bring over some anticuchos, which means “cut stew meat” in the traditional Quecha language. These thick skewered beef hearts slow cooked over a smoking coal pit originated as an Andean staple but are now enjoyed in cities and towns small and large throughout the country. The ends of the skewers usually include a piece of potato, and are accompanied with various dipping sauces, many of which have a spicy kick to them. Though filling, anticuchos are usually just eaten as appetizers, so be sure not to eat too many before your main course arrives! Anticuchos, skewered and grilled beef hearts, are a most common dinner entree in Peru. The texture and taste is much like regular grilled beef meat. 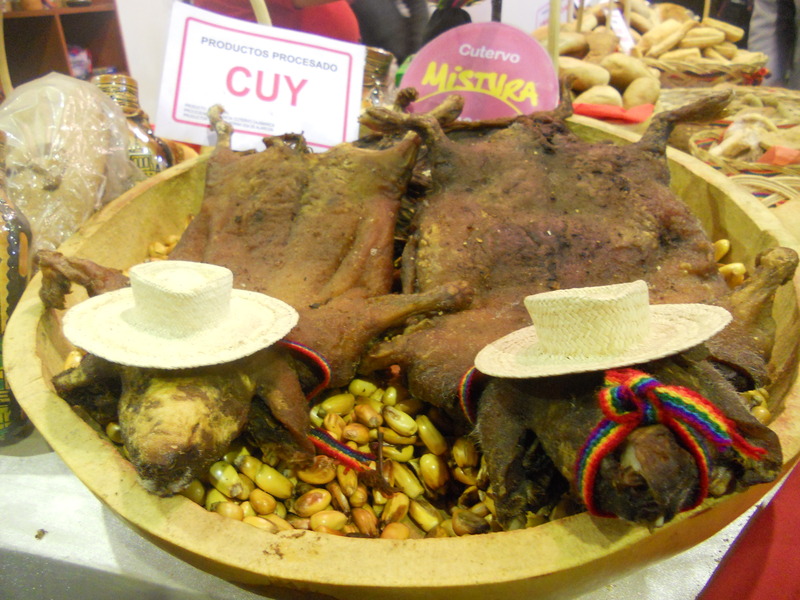 Cuy - Guinea pigs are recognized as cute, furry pets in many countries, but in Peru, they are seen as food. This dish originated in the high mountain Sierra regions as well over 2,000 years ago, and the small creatures are farmed throughout the country to satisfy supply. Typically, cuy is grilled and served with potatoes and small servings of vegetables. It is not the meatiest entrée, but the rich, savory flavor is often compared to that of duck or turkey. Although it is commonly found on daily menus, cuy is still considered a relatively formal dish enjoyed by families on special occasions and holidays. Cuy, grilled guinea pig, is a popular Peruvian dish that originated from the high Andean regions. 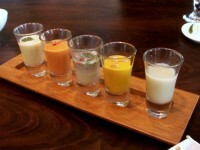 Leche de tigre - If you are a fan of ceviche, you might enjoy this drink on your next Lima holiday. Peruvians claim to have found the perfect hangover cure (and, allegedly, aphrodisiac) in the remains of their most favorite dish. Leche de tigre, or tiger’s milk, is the grayish-white liquid left over from a ceviche marinade, which is made of lime juice, sliced onions, a dash of chili pepper, cilantro, salt, and fish juice. As garnish, a cocktail shrimp or two might be latched onto the glass’ edge. But even if you know what to expect, a glass of leche de tigre will likely still knock you back with its intense acidity and tanginess, almost to toxic levels for the amateur. Yet, it might be just what you need after a night enjoying pisco sours! Leche de Tigre, the marinade left over in a ceviche dish, will pucker you up and prepare you for the day.